For the first time I know about Blenger Burger is in the TV culinary program that report by Mr. Bondan and its very long time ago until I'm drooling with the Mr. Bondan review. I think its happend when I'm in senior high school. Several months from that day in Malang there are the kind of Burger like Burger Buto and Klenger Burger. 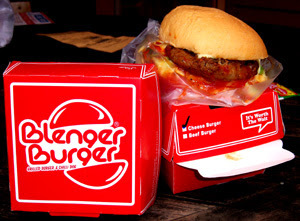 I'm very curious, but I still want to eat Blenger Burger that only has stores in Jakarta. When I am moving to Jakarta, I forgot Blenger Burger until several months ago Gojek officially launched their new menu Go Food and Blenger Burger become one of the best seller menu. In fact, the nearest store is still far away from home, but not more than 25 km so Go Food can provide me this best seller menu. So I decide to buy Blenger Burger as soon as possible. The burger is coming and I can't wait to eat it. The sauce taste is delicious, the bread is fluffy, the meat is delicious like a steak, the vegetable also delicious too, and for sure I hate mayo but I like Blenger burger's mayo so much. I think Blenger burger is more delicious than Carls Jr that for the time its one of my favorite burgers., but different with the portion, Carls Jr is still the big ones. The price around 18K IDR its very cheap and delicious. Someday I'll repurchase it.